I'm taking a little break from posting road trip pictures to talk about Robot Room Decor! When we decided on JD's big boy room theme I began looking for robot crib bedding or robot fabric (which is really hard to find) and few weeks ago I came across a robot sheet set at Pottery Barn Kids, I completely fell in love with it; unfortunately it was no longer available. I'm one of those crazy people, once I see something I really love I will work as hard as possible to get it, which usually means doing a whole bunch of research, keeping in mind that I never pay full price for anything. 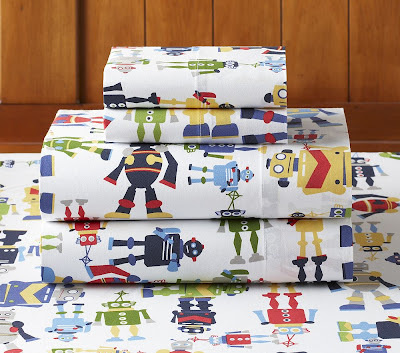 After searching online for weeks, I finally found the Pottery Barn robot sheet set on eBay, but the seller was asking $499.00 (claiming it was rare) and that was just ridiculous, especially since I just wanted the material to make JD his own bedding! Well, on Friday I finally found the robot bedding on eBay at a “reasonable price” and by Saturday morning after a 10 minute bidding battle, I won it for $50 bucks and it's on it's way now. 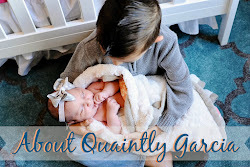 I can't wait to get started, my mom and I already have a sewing day planned! Here are some of the things I will be making (with my moms help) for JD's new big boy robot room. My thought is, if you can't find what your looking for, make it one of a kind by making it yourself! So cute! Can't wait to see the finished room!! What a cute theme! Can't wait to see more pics on his new room. My name is Arielle and I work with a small publicity company that partners with Christian authors trying to get their books off the ground. I read through many blogs to find the best possible readers for our authors. I am very eager to add you personally to my list of reviewers for a specific book.